Jehoahaz was Josiah’s younger (than Jehoiakim) son, He was 23 when he became the king of Judah and he reigned for 3 months. He was evil and worshipped idols. 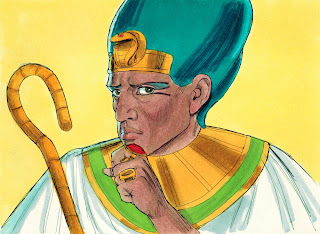 Pharaoh Necho of Egypt put Jehoahaz in prison at Riblah in Hamath so he couldn’t reign in Jerusalem. Pharaoh forced a tribute to be paid of 100 talents of silver and a talent of gold. Then Pharaoh put Eliakim (son of Jehoahaz) the king of Judah. Pharaoh changed his name to Jehoiakim and took Jehoahaz to Egypt. Jehoahaz died in Egypt. Jehoiakim was the older son of Josiah. His name was changed from Eliakim by Pharaoh Necho of Egypt. He was 25 years old when he became the king of Judah. He reigned for 11 years in Jerusalem. He was evil and worshipped idols. 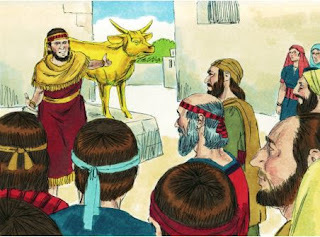 Jehoiakim gave Pharaoh Necho the gold and silver that was a forced tribute for 3 years. But to do so, he taxed the all the people of the land. During the 4th year of Jehoiakim’s reign, God told Jeremiah to write all the words that He had told Jeremiah about Israel and Judah. God thought that maybe if the people heard what God planned to bring upon them, they would change their evil ways. Jeremiah told Baruch what to write on the scroll. Jeremiah instructed him to go and read the scroll to all the people on the day of fasting. In the 5th year of his reign, the people from Judah proclaimed a fast and Baruch read from the scroll. He was at the entry of the New Gate of the temple in the upper court where everyone could hear him read. Michaiah heard the words of the scroll and went to the scribe’s chamber in the king’s house and told the princes that were sitting there what he had heard. They sent Jehudi to Baruch. He went to the princes and read the scroll to them. They were scared when they heard the words and said they would tell the king. They told Baruch and Jeremiah to hide. They went to the court of the king and told him what Jeremiah’s scroll said. The king sent for the scroll and it was read to the king and the princes that were there. The king happened to be in his winter house and there was a fire burning. After Jehudi read 3 or 4 columns, the king took it and cut it with the scribe’s knife. Then he threw it into the fire. The king and the princes were not even worried about the words Jeremiah had written! The king wanted Jeremiah and Baruch taken, but God hid them. After the king burned the scroll, God told Jeremiah to write the same words on another scroll. Jeremiah was told to speak to King Jehoiakim of Judah and tell him that he would be punished for their sins. King Nebuchadnezzar of Babylon went to Judah and besieged the land. Then Jehoiakim fought against the Babylonians and he was merciless. About this time the king of Babylon had taken a lot of the land in Egypt. Pharaoh stayed in Egypt and didn’t return to Judah. King Nebuchadnezzar fought against Jehoiakim and took him prisoner. He put bronze shackles on Jehoiakim and took him to Babylon. 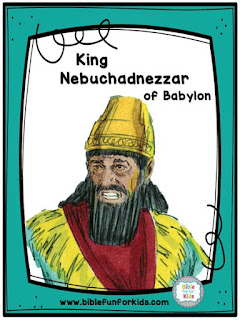 King Nebuchadnezzar also took some items from the temple with him to Babylon. He put them in the temple in Babylon. When Jehoiakim died, his son Jehoiachin became the king of Judah. Jehoiachin was the son of Jehoiakim and was 18 years old when he became the king of Judah. He reigned for 3 months. He was evil and worshipped the idols that his father did. King Nebuchadnezzar of Babylon besieged Jerusalem. King Jehoiachin of Judah went with his mother, princes, servants and officers to the king of Babylon and they were taken prisoners. 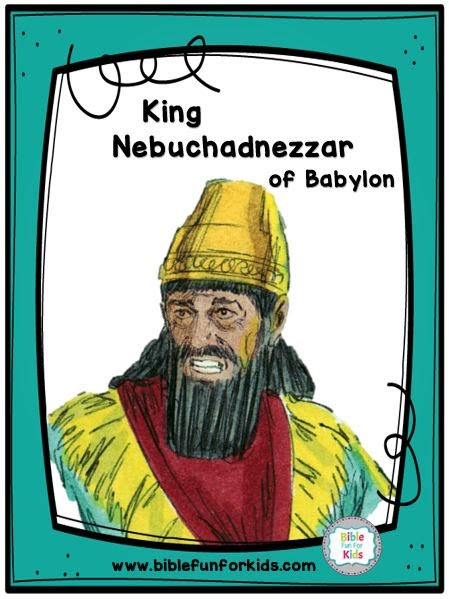 It was the 8th year of King Nebuchadnezzar’s reign. The Babylonians removed all the treasures from the temple and the king’s house. He cut up all the articles of gold which King Solomon had made. He took everyone captive except for the poorest of the land of Judah. The king of Babylon made Jehoiachin’s uncle the king of Judah and changed his name from Mattaniah to Zedekiah. Because of their evil ways and worshipping idols, God was angry and let these things happen to the kings and people of Judah. During the 37th year of Jehoiachin’s captivity, the new king of Babylon released him from prison. King Evil-Merodach spoke kindly to him and gave him a more prominent seat than the other kings that were in Babylon. Jehoiachin took off his prison clothes and ate his food with kings regularly. The king of Babylon provided him with a ration of food each day the rest of his life. Zedekiah 21 years old when he became the king He was Jehoiachin’s uncle. The king of Babylon changed his name from Mattaniah to Zedekiah. He was the king of Judah for 11 years. He was the last king of Judah. During the 9th year of his reign, King Nebuchadnezzar surrounded Jerusalem and built a wall around it. During the 11th year, there wasn’t any food for the people because the famine was so severe. The soldiers of Judah escaped during the night. But, the Chaldean army followed King Zedekiah and caught up with him in the plains of Jericho. They took King Zedekiah to the king of Babylon at Riblah. They killed his sons right in front of him, then they put out Zedekiah’s eyes and secured him with bronze shackles and took him to Babylon. He died a prisoner in Babylon. During the 19th year of King Nebuchadnezzar’s reign, the Babylonians returned to Jerusalem. They burned down the temple of the Lord, the king’s house and all the palaces in Jerusalem. They broke down the walls surrounding Jerusalem and it was desolate. I love these Spell-It-Out letter visuals! These King Jehoiakim were designed by Christina Barkley and includes the outline written by her. These were recreated with permission with different graphics to share here. Click here to download. Also by Christina Barkley is a scroll activity to review the King Jehoiakim and Jeremiah. This includes a sample word list, color & black & white scrolls to print. Click here to download. The application packs contain any extra posters, worksheets, maps, etc. specific for the king(s) listed. Each set is different and may contain printables that will be used for more than one king. 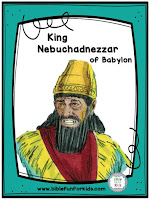 This pack has the posters and worksheets and includes the King Nebuchadnezzar poster. Click here to download the visuals for Jehoiakim. Click here to download the pictures to color for Jehoiakim. Click here to download the visuals for Jehoiachin & Zedekiah. Click here to download the pictures to color for Jehoiachin & Zedekiah.